Admiral Thomas Moorer: Betrayal behind Israeli attack on US ship "After State Department officials and historians assembled in Washington, D.C., last week to discuss the 1967 war in the Middle East, I am compelled to speak out about one of U.S. history's most shocking cover-ups. On June 8, 1967, Israel attacked our proud naval ship -- the USS Liberty -- killing 34 American servicemen and wounding 172. Those men were then betrayed and left to die by our own government.¼"
USS Liberty: Israeli pilot speaks up "After the attack Secretary of State Dean Rusk recommended a strong response, and Presidential Counselor Clark Clifford advised President Johnson to treat Israel in the same manner as the U.S. would treat the Soviets or the Arabs if they had committed the atrocity. The U.S. would certainly not have taken this insult in silence had the offender been any country but Israel. But President Johnson stoically accepted Israel's explanation. 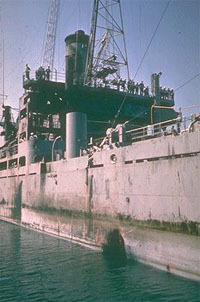 The Navy conducted a Court of Inquiry, which ignored and even suppressed testimony that the attack had been deliberate; it dealt only with the actions and performance of the Liberty crew. State Department legal advisor Carl Salans performed an assessment of Israel's official explanation; with only the Navy's highly incomplete and erroneous preliminary investigation to go on, he thoroughly discredited the Israeli Government's claims of innocent error. The logical next step was to confront the Israelis with his findings, but that was not done. The U.S. Government's inaction was completely out of keeping with the outrageousness of the attack." USS LIBERTY Memorial Official website dedicated to the 34 sailors who lost their lives as the result of Israeli aggression. "Joe Lieberman issued the following statement in response to the Drudge Report's discovery of congressional testimony from September 2002 in which Wes Clark made the case for war in Iraq. The report provides evidence directly contradicting Clark's repeated claims that he has been 'very consistent' on the war 'from the very beginning.'" FBI director says attack quite likely "The F.B.I. director, Robert S. Mueller III, said on Wednesday that terrorists would 'quite probably' strike the United States again and that Al Qaeda remained a major threat despite the lowering of the nation's threat status last week." 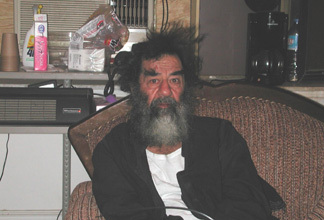 Apparent Saddam capture photos surface "New photographs that appear to be of Saddam Hussein on the day of his capture by U.S. forces are circulating around the Internet one month after the ousted Iraqi leader was found in a narrow hole in the ground." Myers says intelligence gleaned since Saddam capture makes Iraq safer "US General Richard Myers said Thursday US-led forces had gained valuable intelligence since Saddam Hussein was captured and proclaimed Iraq a safer place with more Iraqis offering information. Myers, the chairman of the Joint Chiefs of Staff, also dismissed any notions that coalition forces were 'mired down' by insurgency." Patrick Buchanan Real message of Bush amnesty "If George Bush's amnesty for between 8 million and 14 million illegal aliens is enacted, you can kiss the old America goodbye. Consider what the president is saying with his amnesty. He is telling us that he cannot or will not do his constitutional duty to defend the states from invasion. He is saying he simply cannot or will not protect our borders or enforce our immigration laws. He is saying he will no longer send illegal aliens back. Not long ago, this would have produced calls for impeachment and cries that, 'If Bush won't enforce our laws, let's elect a president who will.' By offering amnesty and residency to millions who broke in line, broke our laws and broke into our country, Bush is not only rewarding wholesale criminality, he proposes to legalize it." Gibson plans record wide release of The Passion of the Christ "'I knew it would start building and building, but now it's like a tsunami,' said Bob Berney, president of the movie's distributor, New Market Films. 'We've had a flood of calls. People call and say, "I want 10,000 tickets."'" British peace activist Hurndall dies "A British activist who had been in a coma since being shot by Israeli troops while acting as a so-called human shield has died nine months after the shooting, a statement from his campaign group says. 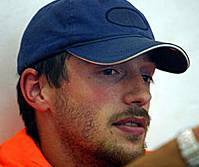 Tom Hurndall died late on Tuesday in the London hospital where he had been lying clinically dead after being shot in the head by Israeli forces on April 11 last year." British peace activist dies in coma after being shot by Israeli soldier "Speaking on BBC radio, Hurndall's sister Sophie Hurndall said the family felt 'a great sadness,' but also 'a sense of relief' that his suffering was finally over. But she held out hope that justice would eventually be done. "The army has been, the whole way along with this, trying to get itself off the hook and its soldiers," she said. "In my mind, there is absolutely no question that it was absolutely premeditated. We know that he (the soldier) was using a telescopic lens. We know that he's lied consistently. We know that other soldiers lie for him. We know that he knew that Tom was wearing an orange jacket. And he's confessed that he knew Tom was unarmed at the time.' Carl Arrindell, a spokesman for the Hurndalls, said: 'The family are absolutely determined to pursue this soldier.'" Israeli soldier faces manslaughter charge over Briton's death "An Israeli soldier is expected to be charged with manslaughter following the death of British peace activist Tom Hurndall, who was shot in the head nine months ago in the Gaza strip, Israeli military sources said today." O'Neill says he wanted to spark debate "Paul O'Neill says he wanted to participate in a book that reveals the inner workings of the Bush administration because he believes the current political system badly stifles meaningful debate on public issues and needs to be fixed. 'I hope people will read it because I think it makes a contribution to illuminating, especially for young people, what I consider to be a bipartisan, broken political process,' O'Neill said.¼"
"The Bush Administration, reported The New York Times on January 8, 'has quietly withdrawn from Iraq a 400-member military team whose job was to scour the country for military equipment. The step was described by some military officials as a sign that the administration might have lowered its sights and no longer expected to uncover the caches of chemical and biological weapons that the White House cited as a principal reason for going to war last March.'" The Bushies have good reason to think they won't find any weapons of mass destruction (WMD) in Iraq. They knew full well that the flimsy reports they used to sell their sleazy oil war were more than four years out of date--ancient history by intelligence standards. And, as The Washington Post reports, a newly discovered memo to Saddam Hussein (news - web sites) indicates that Mr. Worse Than Hitler got rid of his WMDs in 1991. Unlike the United States, which unilaterally partitioned Iraq into no-fly zones and created a new Kurdish state, Saddam appears to have complied with the ceasefire agreement that ended the Gulf War (news - web sites). Cuba: Further bans on freedom of expression "Amnesty International today expressed concern at the impact on freedom of expression and information of Cuba's new law restricting internet access. 'The new measures, which limit and impede unofficial internet use, constitute yet another attempt to cut off Cubans' access to alternative views and a space for discussing them," said Amnesty International as a new law came into force on Saturday. 'This step, coming on top of last year's prosecution of 75 activists for peacefully expressing their views, gives the authorities another mechanism for repressing dissent and punishing critics.'" U.S.: Fewer attacks since Saddam capture "Guerrilla attacks on the 150,000 U.S.-led coalition soldiers in Iraq have dropped sharply since the Dec. 13 capture of Saddam Hussein, and the number of troops killed and wounded has plummeted as well. The figures appear to show the capture of Saddam has taken some of the sting out of the Iraqi insurgency. But one top U.S. military official said guerrilla attacks were already on the decline before Saddam was found hiding in a coffin-sized bunker near his hometown of Tikrit. " Secrets of Howard Dean revealed "The sister of a murdered Vermonter says that Howard Dean, who now claims to support the death penalty, 'never gave us any support' when her family sought the death penalty for the killer and 'couldn’t get us out of his office quickly enough when we tried to talk to him about it.' Barbara Tuttle’s sister, 53-year-old Teresca King, was abducted from Vermont and brutally murdered on November 27, 2000. King was one of three people killed by a drug-crazed duo. Then-Vermont Governor Dean 'was of no assistance to us at all,' Tuttle says." Reviving the draft "With roughly half of our Army committed to the Iraq occupation, and additional geopolitical challenges looming on the horizon, the return of conscription is a very real possibility." The ultimate inversion: Don't live in Wilmette, Illinois "Don’t even think about ever living in Wilmette, Illinois if you believe you have a God given inalienable right to defend your family. Hale DeMar is a Chicago area homeowner who has been charged with violating an insane local ordinance banning possession of handguns.¼That Wilmette Police Chief, George Carpenter, said, 'We much prefer, for the safety of the home, that a resident who finds himself in this situation immediately lock the door of the room he's in and dial 911.' I’m surprised he didn’t suggest huddling in a corner with a blanket over your head." The illegal-alien crime wave "Some of the most violent criminals at large today are illegal aliens. Yet in cities where the crime these aliens commit is highest, the police cannot use the most obvious tool to apprehend them: their immigration status. In Los Angeles, for example, dozens of members of a ruthless Salvadoran prison gang have sneaked back into town after having been deported for such crimes as murder, assault with a deadly weapon, and drug trafficking. Police officers know who they are and know that their mere presence in the country is a felony. Yet should a cop arrest an illegal gangbanger for felonious reentry, it is he who will be treated as a criminal, for violating the LAPD’s rule against enforcing immigration law." Crime victims of illegal aliens "It is particularly shocking that even in post-911 America, the government still refuses to protect the people in the most basic ways from the world's terrorists and criminals who enter at will to do as they please. The borders remain a sieve while the human carnage from crime perpetrated from illegal aliens continues to mount. In another stunner of INS malfeasance, the agency often cannot even manage to deport dangerous criminal aliens when they reach the ends of their prison terms." Dealers of death: The right-to-die movement is using Terri Schiavo. Are you next? "The story of Terri Schindler-Schiavo will break your heart. This poor woman collapsed in her Florida home some thirteen years ago and suffered severe brain damage. Ten years ago, a medical malpractice case awarded $750,000 for her rehabilitation. But her husband (and guardian) has since forbidden any attempts at rehabilitation. For years, Terri has been languishing while her husband seeks court approval to kill her. In fact, he’s spent over half her rehabilitation money paying attorneys in an attempt to starve and dehydrate Terri by removing her feeding tube. Her parents’ heroic determination to fight Mr. Schiavo has helped Terri survive two such attempts." Speculations rife in the Arab world about Saddam’s capture "The speculation even includes claims, reportedly based on secret service information, that US forces had actually captured the former dictator as early as last September and then taken him to Washington." Army War College: Iraq invasion was "unnecessary" "The invasion of Iraq was an unnecessary part of America’s 'dangerously indiscriminate and ambitious' war on terror, according to a report published by the US Army War College today. The paper calls the so-called global war on terror “unrealistic”, warning that it could drag the US into conflicts with countries that pose no real threat." Big Brother Britain, 2004 "More than four million surveillance cameras monitor our every move, making Britain the most-watched nation in the world, research has revealed. The number of closed circuit television (CCTV) cameras has quadrupled in the past three years, and there is now one for every 14 people in the UK." Focus: Scared new world "You want to go home, but you can't. The Army has sealed off your street without warning and evacuated everyone in it. Your home is only a few yards away beyond the cordon, but there is no chance of entry: the soldier in the gas mask has orders to shoot anyone who crosses the line. He will not tell you where your family is, or why an armored vehicle is shunting your car across the road, shattering its windows." Orwell Today A website that stays on top of the how privacy and other basic freedoms are under attack in ways that were being accurately predicted over 50 years ago by George Orwell, in 1984, his dark novel about totalitarianism coming to the West. Michigan online ballot spurs new strategies for Democrats "The virtual ballot box has arrived in Michigan. Democrats in this state are the only voters in the country who have the option of voting online in the presidential primaries this year." "Well, bunk. The case has been shunted back and forth between the Sixth Judicial Circuit Court and the Florida Second District Court of Appeal, where the rulings have been repeatedly replayed like a looping audio tape. Only one trial judge and one appellate court actually reviewed the evidentiary record. Moreover, contrary to Felos's assertion, the Florida Supreme Court and the U.S. Supreme Court did not look at the facts. Rather, both declined to review the case. Refusing to rule is not the same thing at all as studying the record." Report: Gibson film causing Vatican rift "A debate over Mel Gibson’s film The Passion of the Christ has involved a heated clash between Vatican liberals and conservatives, exposing an alleged power struggle between intimates of Pope John Paul II and those who resent conservative influence on the Holy Father, a top Jewish publication says. The Forward, the nation's leading Jewish weekly, reports that Vatican liberals question claims that when the pope saw the film he commented, 'It is as it was.'" California congressman seeks dirty words ban from TV "Rep. Doug Ose of Sacramento has seven dirty words very much on his mind, courtesy of such free speakers as U2 singer Bono and Nicole Richie, the rich kid co-star of 'The Simple Life.' Fed up with recent repeated instances of broadcast TV networks allowing language that many people would deem offensive to be aired live, the Republican House member has introduced a bill that spells out the seven awful words that would be banned from the public air waves in all their forms and all their meanings -- 'including verb, adjective, gerund, participle, and infinitive forms,' as the bill says." Continent Death: euthanasia in Europe "Too many people think with their hearts instead of their brains. Wanting the world to suit their desires, when faced with hard truths to the contrary, they refuse to face facts they don’t want to believe. This common human failing has a name: self-delusion. "Self-delusion is rampant in the euthanasia movement. Most proponents recognize that it is inherently dangerous to legalize killing. But they desperately want to believe that they can control the grim reaper. Thus, they continue to peddle the nonsense that 'guidelines will protect against abuse' despite overwhelming empirical evidence to the contrary." Iraqi WMDs: Myths...and more myths "The administration of United States President George W Bush 'systematically misrepresented' the threat posed by Iraq's weapons of mass destruction (WMD), three non-proliferation experts from a prominent think tank charged on Thursday." Why people fear guns "People fear guns. Yet, while guns make it easier for bad things to happen, they also make it easier for people to protect themselves. With the avalanche of horrific news stories about guns over the years, it's no wonder people find it hard to believe that, according to surveys (one I conducted for 2002 for my book, The Bias Against Guns, and three earlier academic surveys by different researchers published in such journals as the Journal of Criminal Justice) there are about two million defensive gun uses (search) each year; guns are used defensively four times more frequently than they are to commit crimes. " Iraqis fear POW status may prevent Saddam trial "Iraqi officials expressed fears Saturday that a Pentagon decision to declare Saddam Hussein a prisoner of war will prevent them from putting the ousted dictator on trial. The international Red Cross, however, said POW status does not preclude a war-crimes prosecution. "U.S. officials in Baghdad sought to assure Iraqis that no deal was made to keep them from trying the ousted dictator for war crimes and crimes against humanity. " 'Soft treatment' fails to get Saddam to talk "Saddam Hussein has been formally declared an enemy prisoner of war, but is still resisting pressure to help his American interrogators after three weeks in custody." What they don't want you to know "In 'The Banality of Evil,' Edward S. Herman wrote, 'Doing terrible things in an organized and systematic way rests on "normalization"... There is usually a division of labor in doing and rationalizing the unthinkable, with the direct brutalizing and killing done by one set of individuals... others working on improving technology (a better crematory gas, a longer burning and more adhesive Napalm, bomb fragments that penetrate flesh in hard-to-trace patterns). It is the function of the experts, and the mainstream media, to normalize the unthinkable for the general public.'" How to lose your job in talk radio: Clear Channel gags an anti-war conservative "It seems to me that when there is reason to go to war, it should be self-evident. The Secretary of State should not need to convince a skeptical world with satellite photos of a couple of Toyota pickups and a dumpster. And faced with a legitimate casus belli, it should not be hard to muster an actual constitutional declaration of war." Pentagon: Saddam declared "enemy prisoner of war" "The Pentagon made it official: deposed Iraqi dictator Saddam Hussein, captured by US troops as he cowered in a hole in the ground near his home town December 13, is 'an enemy prisoner of war' under the Geneva Conventions." Rice: No evidence Iraq moved WMDs to Syria "The United States has no credible evidence that Iraq moved weapons of mass destruction into Syria early last year before the U.S.-led war that drove Saddam Hussein from power, National Security Adviser Condoleezza Rice said Friday." George Bush's big-government conservatism "In his first three years as president, George Bush has cut taxes three times and yet orchestrated a sharp rise in public spending—not just, or indeed mainly, on foreign wars and 'homeland security,' but also on domestic matters. For instance, spending on education has jumped by three-fifths since 2000, and spending on transport has risen by nearly half. Lower taxes, higher spending: the outcome is that the federal government, despite a steep fall in the interest it pays on its debt, has swung sharply into deficit—$450 billion this fiscal year, by most accounts." The Pharisee's role in gold and the dollar crash "Since Day 9-11, the US dollar has fallen over 40% as compared to the Euro, the European currency “basket.” About half of that drop occurred since May 2, 2003, when hostilities in Iraq were reported to have ended. This means that had you or I been in the know we could have earned about 10 years of savings account interest in only six months, without buying a thing.¼"
Gov. Bush request for Schiavo advocate denied Gov. Jeb Bush's request that an independent advocate continue watching out for Terri Schiavo, the brain-damaged woman at the center of a life-and-death legal battle, was turned down Friday by the chief circuit judge for Pinellas County. Ohio Governor signs into law hidden gun bill "Gov. Bob Taft waited less than 24 hours to affix his signature to a controversial bill to allow Ohioans to carry hidden handguns on themselves and in their cars. He signed the bill without fanfare, making Ohio the 46th state to pass concealed-carry legislation. The law will take effect by mid-April." Rotten apples and sour grapes Predictable responses from the anti-gun news media. It's time to stop crying wolf "A door-to-door salesman comes to your house selling elephant inhibitors guaranteed to keep you safe from elephants. You ask, 'How do I know it works?' He responds, 'You don't see any elephants, do you?' A senior administration official was asked if all of these groundings and searches of foreign airliners had turned up any terrorists. He replied: 'I don't think we know yet, and we may never know.'" Draft creep (stealth conscription) "Say hello to 'draft creep.' Remember 'bracket creep,' AKA the 'sneaky tax increase,' whereby inflation and income growth forces people into progressively higher tax brackets? Bracket creep is a way for the government to raise taxes without seeming to be raising taxes. There is no congressional debate, and no new law is passed for the President to sign. Taxes just go up. Similarly, draft creep is a way for the government to initiate the draft without seeming to initiate the draft." Stop President Bush’s proposed overhaul of immigration laws! "On January 7, President Bush proposed a drastic overhaul of our immigration laws that (in the words of the New York Times) 'effectively amounts to an amnesty program for illegal immigrants with jobs in the United States....' The Bush amnesty would allow illegal aliens to apply for renewable three-year work permits, which would allow them to travel freely in and out of our country." Bush's plan for illegal aliens pleases few "President Bush's immigration proposal got a mostly cool response from those who grapple with the issue, with conservatives saying it goes too far, pro-immigrant groups saying it doesn't go far enough and some Hispanic groups calling it a hollow electioneering ploy. Many Republicans balked at the bureaucratic headaches ahead, and at the idea of rewarding illegal aliens.¼"
Pat Buchanan: Dean: A prophet ahead of his time? "Like his father, Bush is running up huge deficits and increasing the domain of federal bureaucrats. He, too, is a champion of foreign aid and intervention to build a New World Order. He, too, is a global democratist who cites Wilson and FDR. He, too, is a 'big government conservative' like his dad. Since taking his oath, he has not killed one federal program, agency or department, or vetoed a single bill." 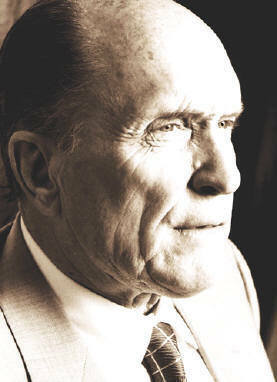 Duvall rebukes Spielberg for Castro visit "Acknowledging his comments would cut off his professional relationship, actor Robert Duvall criticized filmmaker Steven Spielberg for consorting with Cuban dictator Fidel Castro. 'Spielberg went down there recently and said, "The best seven hours I ever spent was actually with Fidel Castro." Now, what I want to ask him ... "Would you consider building a little annex on the Holocaust museum, or at least across the street, to honor the dead Cubans that Castro killed." That's very presumptuous of him to go there,' Duvall told [60 Minutes II's Charlie] Rose, according to a CBS transcript." What to do with Saddam? "Should Saddam be tried by the UN — at a special tribunal, à la the Balkans trial of Slobodan Milosevic — or at the newly functioning International Criminal Court? Independence-minded Americans understand that creating such a precedent would dangerously empower the United Nations.¼"
Germany: "CIA misinformed about Ansar" "Sources at the German intelligence bureau claim that CIA misinformed them about the alleged planned terror action in Hamburg December 30. Ansar al-Islam was accused of being behind the attempt." Israeli Army chief warns Syria could face air strikes "Lt.-Gen. Moshe Yaalon’s warning in comments broadcast on Army Radio came as Israel indicated it was testing whether Syrian President Bashar Assad was truly interested in resuming peace talks. On Oct. 5, Israel struck what it said was a militant training camp deep in Syrian territory after a Palestinian suicide bomber killed 23 people in a restaurant in the Israeli city of Haifa. Syria said Israel hit a civilian site." Blair promises to quit if Kelly report shows he lied to MPs Tony Blair's role in the naming of Dr David Kelly was thrust back into the spotlight yesterday when he said he would resign if the Hutton Inquiry showed he had lied to Parliament. The Prime Minister stood by his denial of responsibility for the leaking of the weapons scientist's name shortly before he committed suicide." "Nationally syndicated radio talk show host Rush Limbaugh has seen the light, or maybe felt the heat. In either case, he suddenly realizes the consequences of living in a society where government agencies have unfettered access to personal information and where individuals have little or no constitutional protections. Welcome back, Rush." Limbaugh lawyers appeal over records "Rush Limbaugh's attorneys took the fight over his medical records to an appeals court on Wednesday in an effort to keep the records sealed while they seek to reverse a judge's order opening them up to prosecutors investigating the conservative radio commentator's prescription drug use." Terri's husband reportedly engaged "Terri Schiavo`s family is urging a judge to reappoint an independent guardian in the case, because they claim Terri`s husband Michael is engaged to another woman." The Ephedra Ban: First step by Feds towards total control of all dietary supplements? Two-faced power "Consider the ban on the diet supplement ephedra, a mild stimulant that humans have used for thousands of years. The Food and Drug Administration could not cite any grave threat to human health posed by ephedra, merely an opinion that bureaucrats in Washington would not use the stuff. OK, fair enough. If absolute suppression of all possible threats to human health is the goal, then let's roll with the ephedra ban. Except that across town from the dire warning on ephedra, another group of bureaucrats was busy changing the federal rules on how much sleep truckers need." Ephedra ban goes too far "When the U.S. government announced last week that it was banning the weight-loss herb ephedra, a couple of thoughts came to mind. First, it's a pretty serious step for the feds to ban a dietary supplement, something they've never done. Second, don't you think the Metabolite executives and other ephedra peddlers wish they had a fraction of the clout of Big Tobacco?" Jumping the gun "The beginning of the end for naturally produced ephedra was probably the death last spring of a baseball player who was grossly overweight, had liver disease and high blood pressure and was practicing in hot weather. 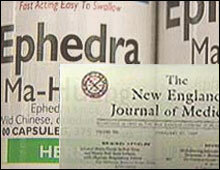 And, oh yes, he reportedly had taken a dietary supplement that included ephedra." Ephedra Education Council "The pressure on FDA is the result of overreaction to and over-reporting of adverse reactions, not clinical studies. The RAND report and even critics of ephedra acknowledge it is not possible to determine whether these reports are in any way linked to ephedra consumption.¼"
Jewish academic calls for the end of Israel as a Zionist state "Tony Judt is a scholar who was until recently best known for his writings on European history. But then, in a 2,900-word essay in the October 23 edition of The New York Review of Books, Judt dropped the intellectual equivalent of a nuclear bomb on Zionism, calling for the dismantling of Israel as a Jewish state. Saddam's questioning could become public "CIA interrogators taking on Saddam Hussein must contend with the likelihood that some of their questioning could become public during his eventual trial. That means decisions now on how to conduct the questioning and record the conversations, U.S. officials say." Charles "behind Princess car crash death plot" "Prince Charles has been named as the "senior member of the Royal family" whom Diana, Princess of Wales, believed was plotting to kill her in a car crash. The naming, which has been described as 'the mother of revelations,' is bound to send shockwaves through Buckingham Palace. Diana made the allegation in a letter written ten months before she died in a Paris car crash in 1997." Kelly "suicide" report delayed "Lord Hutton has delayed publication of his long-awaited report on the events leading to the death of David Kelly because he has yet to apportion final blame on the central figures in the drama, the Guardian learned last night." Like Dr Kelly, my father took the blame "Whatever the Hutton report says, when it comes out later this month, my abiding image of the inquiry will not be of angry MPs or worried BBC journalists, but of Dr David Kelly, on the morning before he took his own life, a picture conjured up by his wife, Janice." Tax protester trial begins "Anti-tax protesters from across the country braved a chilly reception inside and outside the federal courthouse Monday when Bedford (Texas) businessman Richard Simkanin went on trial for the second time on charges of violating U.S. tax laws." Terri Schiavo's family urges reinstatement of independent guardian "In court papers filed on Monday, the family of Terri Schiavo is urging a judge to reappoint the independent guardian who was removed from the case in December. The Schindler family also wants the guardian to be able to determine whether Terri's marriage to her estranged husband Michael can be dissolved." Tape "probably Bin Laden"—CIA "CIA analysis suggests a new audiotape purportedly recorded by al-Qaeda leader Osama Bin Laden is genuine.¼Referring to the arrest of Saddam Hussein, the voice on the tape says Arab rulers now fear that dictatorial regimes can be overthrown 'by armed force from abroad, especially after they have seen the arrest of their former comrade.'" Scott Ritter: The search for Iraqi WMD has become a public joke "On 20 March 2003, Bush ordered American military forces, accompanied by the armed forces of Great Britain, to invade Iraq and remove Saddam Hussein from power. In hiding since the fall of Baghdad, Saddam was finally run to ground in December. On his capture, he is reported to have said that WMD was an issue created by George Bush to justify the invasion of Iraq. This is a claim that has increasing validity." Deadly vaccines, recurring Gulf War illnesses, and many unlearned lessons from history "It is not well publicized or widely known that the Central Intelligence Agency (CIA) exercises oversight of infectious disease agencies including the National Institute for Allergies and Infectious Diseases (NIAID) and the Centers for Disease Control and Prevention (CDC), along with important investigations including the Pentagon’s investigation in into Gulf War Illnesses. This is arguably done for “national security” concerns. Their official pronouncements, however, often include conflicting and controversial military and public health determinations." Pennsylvania town targets pro-life sidewalk counselors "Sidewalk counselors in Allentown, Pennsylvania are being threatened with prosecution for offering women alternatives to abortion outside a recently-relocated abortion facility. City officials in Allentown claim the pro-life activists need a permit to stand on a public sidewalk outside the Allentown Women's Center abortion business -- a clear violation of the counselors’ first amendment rights to free speech." Democrats take jabs at Dean in debate before Iowa caucuses "In a feisty first debate of the election year, Howard Dean drew fire from fellow Democrats on Sunday over trade, terrorism, taxes and more, then calmly dismissed his rivals as 'co-opted by the agenda of George Bush. '"For information (including, where applicable, official campaign websites and other supporting sites, lists of endorsements, sites opposition sites, and parody sites) on all the declared candidates for president—Democratic, "third parties," and, believe it or not, Republicans not named Bush—see the Presidency 2004 website. Scientists seek place for God while embracing reason "A recent cover story in Newsweek cited a National Institutes of Health report that found people who regularly attend church live 25 percent longer than those who don't. More than 70 of the nation's 125 medical schools now offer courses in spirituality, up from three a decade ago." Censorship across the divide: "Epithet" that ! My husband received the following letter from a waggish friend: 'I just wanted to wish you and yours a happy holiday. I'll leave it at "holiday" to avoid running afoul of the ACLU....On second thought, I withdraw "holiday." It derives from "holy day," which clearly presents problems. And "season's greetings," a well-known dodge, suggests other difficulties. With global warming, what is a season?...'" Phyllis Schafly reviews Mona Lisa Smile "Proclaimed by CBS-TV as 'the best picture of the year by far,' Mona Lisa Smile is a sanctimonious feminist homily preaching salvation through modern art and making one's own career choices just so long as career does not mean marriage and motherhood. But the sermon boomeranged on reality, and the movie proves again that those who follow that commandment travel a dead-end road." 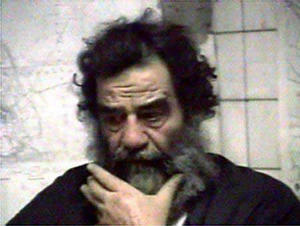 Capture of Saddam raises more questions than it answers "The initial pictures of Saddam after his capture, and the account of his capture given by the US authorities, stunned the world. For months the US had been telling the world that Saddam was alive, thriving in some luxurious hideout, personally overseeing the continuing attacks on American and allied forces. Now he was emerging as a bedraggled and humiliated figure from a hole in a cellar, with no luxuries, no communications with the outside world, and not even access to a barber or shaving kit. It soon became apparent, however, that this is not the whole story. Two alternative scenarios have since emerged, both more likely that the official version, and both improvable without information that only the US has. " Rejoice America, Satan is in custody! "Fox News apparently has discovered Saddam Hussein's real name. Just so the kiddies are certain to get the message, he is always referred to as 'Tyrant Saddam.' Apparently his parents named him Tyrant Saddam Hussein. What prescience on their part. The Chinese Communist butchers recently wined-and-dined by Bush at the White House are not tyrants, of course and neither is Ariel Sharon. Only Arabs and Muslims, or should I say, only those nations without nuclear weapons or a nuclear power willing to shield them with such weapons, are tyrants." Dr. Laura in hot water with "Holocaust" industry "A Holocaust Studies institute is urging radio talk show host Dr. Laura Schlessinger to retract her on-air comments comparing some U.S. day-care centers to child-rearing practices in Nazi Germany." Orwell's "1984" anxiety creeps into the ideals of the free world "Twenty years after 1984, a year author George Orwell prophesied as dark and without freedom, the United States of America has some of the earmarks of Orwell's vision. From his science fiction book, written in 1949, came the chilling admonition, 'Big Brother is watching you.' One clear parallel between Orwell's fictional Oceania -- the central nation in Orwell's book -- and the U.S. government can be found in a comparison of today's war against terrorism and the continuous wars waged by Oceania." Death with dignity, or door to abuse? "Opponents of euthanasia argue that the new law encourages people to end their lives when confronted with suffering, and creates an atmosphere in which doctors feel free to make decisions for death that in many cases go unreported, though failure to report remains counter to the law. 'You should never aim to kill a person -- that's the bottom line,' said Bert P. Dorenbos, chairman of the Dutch anti-euthanasia group Cry For Life. Dorenbos said he has closely followed the case of Terri Schiavo, a Florida woman who has been in a persistent vegetative state for 13 years and whose husband won a court order to have her feeding tubes removed, only to have it overturned by Gov. Jeb Bush and the state legislature. " Nearly one U.S. soldier a day killed since Saddam taken "In the nearly three weeks after the capture of Saddam Hussein, almost one U.S. soldier a day has been killed in action in Iraq. Since the Dec. 13 arrest of the ousted Iraqi strongman, at least 23 American soldiers in all have died there, according to Pentagon and U.S. Central Command reports. Of those, 17 perished in combat circumstances while the rest succumbed to illness, accidents, suicide or other causes." Manifesto demands Bush change regimes in other 'rogue' countries US President George W Bush was sent a public manifesto Tuesday by Washington's hawks, demanding regime change in Syria and Iran and a Cuba-style military blockade of North Korea backed by planning for a pre-emptive strike on its nuclear sites. The manifesto, presented as a 'manual for victory' in the war on terror, also calls for Saudi Arabia and France to be treated not as allies but as rivals and possibly enemies." Big media applaud ban on ephedra "Health and Human Services (HHS) Secretary Tommy Thompson says Americans making New Year’s resolutions to lose weight should do so without products containing ephedra. The major media should adopt a resolution not to serve as lapdogs for Thompson’s agency by helping the trial lawyers destroy the dietary supplement industry. The ban on ephedra is the first step in this campaign. The coverage of this controversy demonstrates that the media bias in favor of big government is back. The only difference this time is that it is Republican big government. It’s no wonder that some conservatives are despondent over the President’s failure to rein in the federal bureaucracy." UN Trojan horses: Stealing our sovereignty civilly "A review of the UN website will reveal innumerable documents purporting to solve the world’s problems, all presented in a way that brooks no contradiction. The papers are laid out beautifully, the language is reasonable, the arguments rational, the conclusions logical and everything appears to be faultless. Everything except the underlying premise: the world is peopled by incompetent ninnies who are hopelessly uneducable and must be guided by the superior beings gracing the halls of the UN. The masses cannot be trusted to find their individual ways to the answer nature’s call without destroying the environment, to say nothing of their inability to raise children, educate themselves, self govern, find suitable employment and generally take care of themselves." The U.S. Holocaust Memorial Museum: A decade of increasing taxpayer funding "It’s not only the legislative branch which supports the Holocaust Memorial Museum, however. On Sept. 3 the Anti-Defamation League—which a few years ago was ordered to cease spying on American citizens—proudly announced that it had been awarded a $100,000 grant from the U.S. Department of Justice Office of Community Oriented Policing Services (COPS) to support a joint ADL/Holocaust Memorial Museum training program for law enforcement professionals." Eight facts about Iraq "Although Bush’s initial justification for war was that Iraq was a 'threat to the United Nations' (certainly no reason for the U.S. to go to war), this was soon shifted to Iraq being a threat to the United States. But even though Secretary of Defense Donald Rumsfeld insisted that 'no terrorist state poses a greater and more immediate threat to the security of our people and the stability of the world than the regime of Saddam Hussein in Iraq,' the condition of Iraq said otherwise. Not only was Iraq’s army considerably weaker than it was during the first Persian Gulf War – a war in which Iraq only managed to kill 148 Americans – but Iraq had no navy or air force.¼"
Your tax dollars at work! NEA funds musical based on the life of "gay" killer "A musical based on the life of San Diego serial killer Andrew Cunanan—whose far-flung victims include fashion designer Gianni Versace—will be developed this year at the La Jolla Playhouse through a $35,000 grant from the National Endowment for the Arts, the Playhouse announced last week." "Passion" follows the Scripture "The Talmud was compiled in about the year 500, drawing on rabbinic material that had been transmitted orally for centuries. From the 16th century on, the text was censored and passages about Jesus and his execution were erased to evade Christian wrath. But the full text was preserved in older manuscripts, and today the censored parts may be found in minuscule type, as an appendix at the back of some Talmud editions. A relevant example comes from the Talmudic division known as Sanhedrin, which deals with procedures of the Jewish high court: 'On the eve of Passover they hung Jesus of Nazareth. And the herald went out before him for 40 days [saying, "Jesus] goes forth to be stoned, because he has practiced magic, enticed and led astray Israel. Anyone who knows anything in his favor, let him come and declare concerning him." And they found nothing in his favor.'" "The International Red Cross says it has met with coalition authorities in Iraq to discuss possible access to former Iraqi leader Saddam Hussein. "'The case of Saddam has come up in routine meetings with the coalition,' said Florian Westphal, spokesman for the International Committee of the Red Cross.'" 9-11 conspiracy theories abound, and inquiry takes note "One theory has it that the Bush administration was warned about the Sept. 11 attacks but did nothing to stop them. Another says a missile fired by the U.S. military, not a hijacked jetliner, struck the Pentagon. Yet another: The Israelis orchestrated the attacks to force the United States into a war against the Arabs." "Smart" guns: Dumb idea! "At first blush it seems like a great idea. A gun that can determine if the person holding it is an authorized user. A smart gun that will fire only if it recognizes the shooter's thumbprint. Pretty neat. Homeowners would want it because it eliminates the danger of their kids or anyone else using it. The cops surely would want it, as it eliminates the danger of a bad guy getting ahold of their weapon and turning the tables. Then there's the problem of teenage suicides--most prevalent where there is easy access to guns, such as the homes of law officers. What's not to like?" Austrians split on "shop a Nazi" campaign "A bizzare ‘shop-thy-neighbor’ campaign has been launched in Austria in the run-up to Christmas in a bid to get Austrians to turn in elderly neighbors they suspect of being Nazi war criminals. The Simon Wiesenthal Center (SWC), which has its headquarters in Los Angeles, has spent thousands of pounds on the double page adverts in Austrian papers in what it claims is a last-ditch attempt to track down Nazi criminals who have gone unpunished." (Real News 24/7: So, now they're finally admitting it: The fearless Nazi hunters are running out of prey! Be assured, however, that the Holocaust lobby, which has turned the so-called Shoah into a lucrative business will, if not exposed for purveying dubious history, find a way to drag this on for generations. Churchill statue "looked too much like Mussolini" "The statue of Winston Churchill now standing in Parliament Square, London, initially bore a little too much resemblance to Benito Mussolini for the liking of government officials." Top Ten health/medical stories of 2003—The Case of Terri Schiavo: Meaningful Life or Hopeless Limbo? "Terri Schiavo suffered brain damage in 1990 and has required tube feedings to keep her alive in a persistent vegetative state. Her husband and parents interpret the situation and Terri's wishes very differently."